NASA’s Low-Density Supersonic Decelerator (LDSD) project completed its second flight test when the saucer-shaped craft splashed down safely Monday in the Pacific Ocean off the coast of the Hawaiian island of Kauai. A post-flight media teleconference will be held at 1 p.m. EDT/7a.m., Tuesday, June 9 to review the test. Two experimental decelerator technologies – a supersonic inflatable aerodynamic decelerator and a supersonic parachute – were tested. The supersonic inflatable aerodynamic decelerator deployed and inflated. The supersonic parachute also deployed; however, it did not perform as expected. Data were obtained on the performance of both innovative braking technologies, and the teams are beginning to study the data. The LDSD team has started powering up the test vehicle for drop, including the GoPros, sensors and main avionics. In a few minutes, the saucer-shaped LDSD test vehicle will be dropped and its powered flight will begin. A fraction of a second after dropping from the balloon, and a few feet below it, four small rocket motors will fire to spin up and gyroscopically stabilize the saucer. Just over two seconds later, a Star 48B long-nozzle, solid-fueled rocket engine will kick in with 17,500 pounds of thrust, sending the test vehicle to the edge of the stratosphere, or about 180,000 feet, at a speed of Mach 4. At about Mach 3.8, the test vehicle will deploy the supersonic inflatable aerodynamic decelerator (SIAD). The SIAD decelerates the vehicle to approximately Mach 2.4. 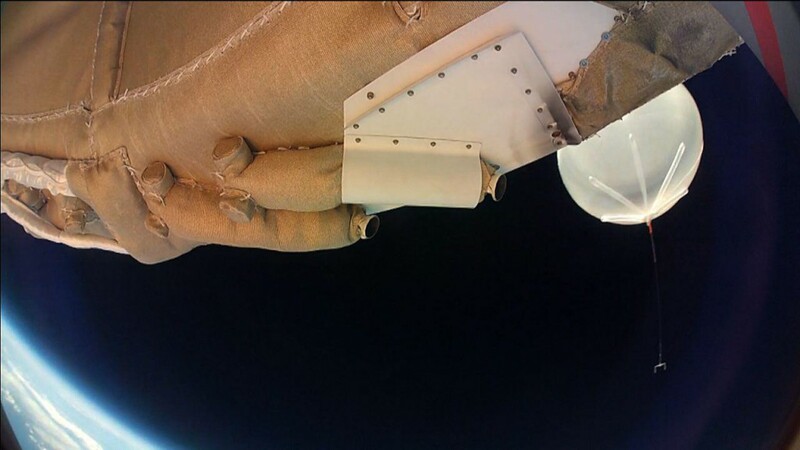 The test vehicle will then deploy a mammoth supersonic ringsail parachute, which will carry the test vehicle to a controlled water impact landing about 40 minutes after being dropped from the balloon. It’s been a little over an hour and 30 minutes since the balloon launched carrying the Low-Density Supersonic Decelerators test vehicle from the U.S. Navy Pacific Missile Range Facility on Kauai, Hawaii. The balloon is currently at 76 thousand feet and traveling west at roughly 25 knots and continues to climb to float altitude. Once the balloon reaches 120 thousand feet, it will be approximately an hour before vehicle drop. Stay tuned for LDSD launch status updates. The large scientific balloon carrying Low-Density Supersonic Decelerators test vehicle lifted off from the U.S. Navy Pacific Missile Range Facility in Kauai, Hawaii, at 7:45 a.m. HST/1: 45 p.m. EDT. The balloon will take approximately three hours to reach its float altitude of 120,000 feet. For more information about LDSD. The Low-Density Supersonic Decelerators project has been proceeding toward launch since the early morning hours at the U.S. Navy Pacific Missile Range Facility in Kauai, Hawaii. The large scientific balloon – 34.4 million cubic feet in volume, has been undoing inflation over the last hour. When launched, the balloon and the test vehicle stand at a towering 980 feet tall. LDSD is proceeding toward launch. The large scientific balloon – 34.4 million cubic feet in volume, has been undoing inflation over the last hour. When launched, the balloon and the test vehicle stand at a towering 980 feet tall. The project is targeting a 7:30 a.m. HST/1:30 p.m. EDT launch. 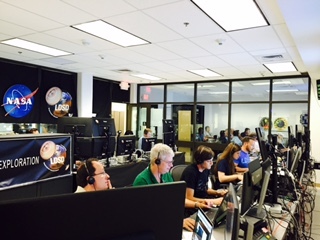 Live commentary will begin on NASA Television and JPL’s Ustream channel at 7 a.m. HST/1 p.m. EDT. Stay tuned for more LDSD updates! The LDSD launch support team is go to report to stations tonight at 9 p.m. HST to begin preparations for a Monday, June 8, 7:30 a.m. HST (1:30 p.m. EDT) launch attempt from the U.S. Navy Pacific Missile Range Facility on Kauai, Hawaii. NASA Television and JPL’s Ustream channel will carry live coverage of the launch beginning at 7 a.m. HST (1 p.m. EDT). 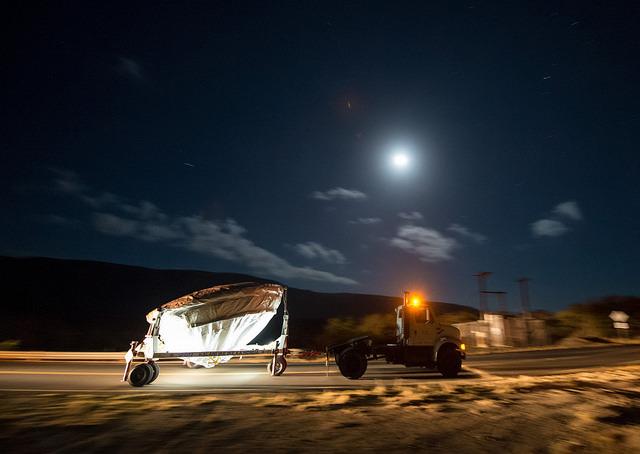 NASA’s Low Density Supersonic Decelerator (LDSD) test vehicle is rolled out to the launch pad under moon light, Wednesday, June 3, 2015, at the U.S. Navy Pacific Missile Range Facility (PMRF) in Kauai, Hawaii. The LDSD crosscutting technology demonstration mission will test two breakthrough technologies that will enable larger payloads to be landed safely on the surface of Mars or other planetary bodies with atmospheres, including Earth. Photo Credit: (NASA/Bill Ingalls). 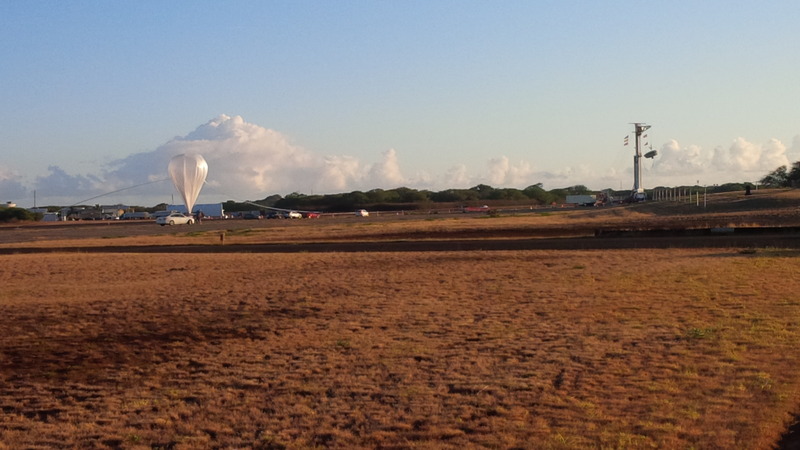 The scientific balloon will begin inflation at 6:15 a.m. HST and after launch will take about three hours to reach its float altitude of 120,000 feet. About 45 minutes after the balloon reaches test altitude, the saucer-shaped LDSD test vehicle will be dropped and its powered flight will begin. A solid-fueled rocket engine will kick in sending the test vehicle to the edge of the stratosphere, or about 180,000 feet, at a speed of Mach 4. At about Mach 3, the test vehicle will deploy the supersonic inflatable aerodynamic decelerator (SIAD). The SIAD decelerates the vehicle to approximately Mach 2.4. The test vehicle will then deploy a supersonic parachute, which will carry the test vehicle to a controlled water impact. The LDSD crosscutting technology demonstration mission will test two braking technologies that will enable larger payloads to be landed safely on the surface of Mars or other planetary bodies with atmospheres, including Earth. To learn more about LDSD. Testing at 120,000 Feet: How Does the Vehicle Get Up There? NASA’s Low-Density Supersonic Decelerators (LDSD) team stands ready to attempt the second flight test of a rocket-powered, saucer-shaped test vehicle into near-space from the U.S. Navy’s Pacific Missile Range Facility on Kauai, Hawaii. Depending on weather conditions and other factors, the test vehicle will begin its flight from a starting point of 120,000 feet over the Pacific Ocean — a little over 22 miles high, deep in Earth’s stratosphere. There, its booster rocket will ignite, pushing it to supersonic speeds as it ascends to approximately 180,000 feet — a little over 34 miles high, penetrating the lower mesosphere. A series of precision steps will take place for the 6-meter supersonic inflatable aerodynamic decelerator (SIAD) and the supersonic parachute to slow the vehicle as it descends through the atmosphere. This ascent, and its subsequent fall back into the ocean, will simulate the kind of supersonic entry and descent speeds a similar vehicle would face in the atmosphere above the planet Mars. So NASA’s first major hurdle is to get the test vehicle to that altitude. How is that accomplished? By use of a large scientific balloon that’s over 600 feet long! 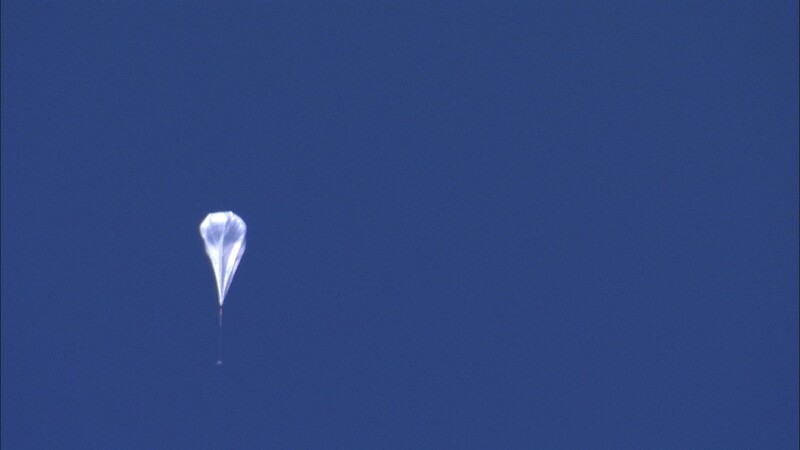 Moments into its powered flight, the LDSD test vehicle captured this image of the balloon which carried it to high altitudes. The image was taken by one of the saucer-shaped test vehicle’s high-resolution cameras. On June 28, 2014, a balloon lifted the 7,000-pound saucer-shaped vehicle to an altitude of 119,000 feet (36,270 meters), then a rocket boosted it even higher, where tests of Martian landing technologies began. 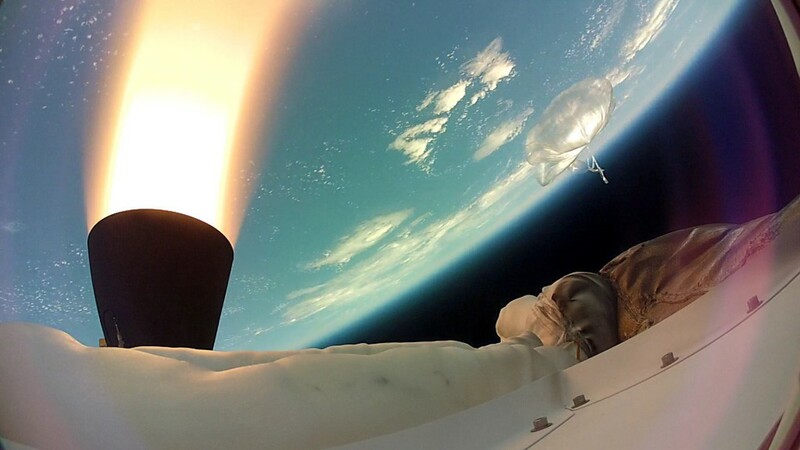 NASA scientific balloons are a proven way to quickly and efficiently launch even large-scale science payloads into Earth’s stratosphere — between 7 and 31 miles up — to undertake missions lasting mere hours or more than a month. For the LDSD flight test, NASA will employ a balloon 34.4 million cubic feet in volume, its helium contained by 22 acres of plastic roughly the thickness of a sandwich bag. When fully deployed, the entire apparatus plus test vehicle stands a towering 980 feet tall. NASA’s Wallops Flight Facility in Wallops Island, Virginia, will oversee its deployment, bringing to bear its extensive expertise in scientific balloon test operations. They’re aided by a team from NASA’s Columbia Scientific Balloon Facility in Palestine, Texas, (operated by Orbital ATK) and Foremost Industries LP of Calgary, Canada, who built a special launch tower to safely launch the balloon used to carry the LDSD test vehicle to its target release altitude. Stay with us for more fascinating insight into the project as we count down to launch! Mission managers have called off a weekend launch attempt for the Low-Density Supersonic Decelerators project due to low altitude wind conditions that would prevent the launch of the balloon. NASA will evaluate the next available launch opportunity, Monday, June 8. NASA’s Low-Density Supersonic Decelerators (LDSD) project will attempt the second flight test of a rocket-powered, saucer-shaped test vehicle into near-space in early June from the U.S. Navy’s Pacific Missile Range Facility on Kauai, Hawaii. The LDSD crosscutting demonstration mission will test breakthrough technologies that will enable large payloads to be safely landed on the surface of Mars, or other planetary bodies with atmospheres, including Earth. These new technologies include a supersonic ballute, supersonic parachute, and a 6-meter Supersonic Inflatable Aerodynamic Decelerator that will enable landing of larger payloads on Mars and allow access to much more of the planet’s surface by enabling landings at higher altitude sites. Stay tuned here and on our social channels – @NASA_Technology, @NASAJPL, @NASA or @NASA_Marshall – for the latest. Mission managers have postponed Friday’s, June 5, Low-Density Supersonic Decelerator launch due to unstable wind conditions near the surface that would prevent the launch of the balloon. NASA will evaluate the next available launch opportunity, Saturday, June 6.